Throughout high school and well into college, I subscribed to Ellery Queen’s Mystery Magazine. Although the Golden Age of mystery “ended” around 1940 and the Silver Age . . . well, did Vietnam end the Silver Age of just about everything? At any rate, let’s say the Silver Age faded through the 1960’s (and someone far more knowledgable can correct me below); nevertheless, EQMM continued to include and reflect the sensibilities of a classic mystery lover well into the 70’s and beyond. Just look at this cover on the left of a copy of EQMM I used to own. Christie, Marsh and Carr headlined the magazine’s 32ndanniversary issue. So did Symons, Highsmith, and Anthony Gilbert. Asimov probably had a Black Widowers’ tale here. And who knows which of the fine Edward D. Hoch series was featured this month: Nick Velvet? Dr. Sam Hawthorne? Captain Leopold? This is the only period in my life where I devoted a serious amount of reading time to short fiction, and it was magnificent. I would devour each issue as it came along. Maybe a story or two wouldn’t quite suit my fancy. Maybe I would discover a brand-new author on these pages. I would finally the magazine with a sigh, satisfied to know that in one short month another issue would come along. Just look at the very next issue! Carr, Creasey, Simenon! Michael (the other) Gilbert! A new parody perhaps by Jon L. Breen. A taut psychological suspense tale from Ursula Curtiss. And if you look in the corner, you’ll see a name that always made me smile: William Brittain. I couldn’t have told you anything about the man while I was reading him. I had no idea that he would give up mystery fiction for a highly successful career writing young adult novels. All I knew was that there were two series he was renowned for, and my spirits lifted when one or the other appeared on the pages of EQMM. My couple hundred copies of EQMM vanished long ago (thanks, mom! ), but one of our great good fortunes is to have the publishing house of Crippen & Landru around to make much of this classic mystery short fiction available for modern readers. And I’m thrilled to announce that the latest entry in the C&L catalogue is The Man Who Read Mysteries, a collection of short fiction by William Brittain. The title is derived from the first series of stories that marked Brittain’s debut in the magazine. (It’s all set down in a foreward by Josh Pachter, to whom I think we owe a huge debt of gratitude for reaching out to Brittain’s widow and connecting her with Jeffrey Marks at C&L.) The titles of all the stories here begin with the words “The Man (or Woman, or Boy or Girl) Who Read – ,“ followed by the name of a famous mystery author. All eleven of these tales are included here, and as you might expect, each of them reflects the specialty of the named author. Some but not all of the tales could be classified as classic mystery, however; in fact, many of them have the sting of a Stanley Ellin, Roald Dahl or O. Henry tale. That is especially true of the first in the series, “The Man Who Read John Dickson Carr” to the point that it does not serve to describe any of the plots. The point is that, in keeping with the wide variety of authors he included here, Brittain avoided becoming formulaic in his own storytelling. To round out the reading list, C&L has dipped into Brittain’s other, longer series featuring the crime-solving science teacher Mr. Strang. 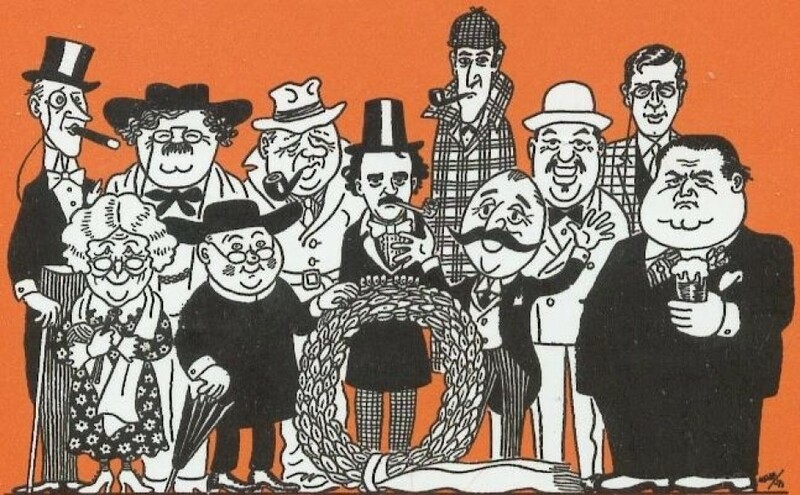 Here Josh selected eight tales that range from the first to the last Mr. Strang tale and including examples from each decade in which he appeared. These are more straightforward tales of detection, where the sleuths scientific and educational knowledge, as well as his understanding of the young people he teaches, aid him in solving cases for the local police. There’s something almost quaint about these tales of a small-town teacher from the early/mid 1960’s: although many of his students get into terrible fixes, it’s clearly a more innocent time than the one I face as a teacher every day. Why, just last week, one of my colleagues caught a student vaping in her class during a test. Just sitting at his desk as neat as you please, vaping in her class!!!! And several weeks ago, one of my students leaned over and whispered something so hideous into another person’s ear that he had to be permanently expelled from my class. There’s an amorality going on today amongst our youth, a sense of entitlement where some of them feel that no action should result in a consequence. The Mr. Strang tales are “old-school” in that justice is served and order restored – and students learn their lesson – even as this funny little man often displays more compassion for his students than they might deserve. Luckily for us, there are more than enough Mr. Strang tales – plus a wealth of standalone stories – to indicate that a second Brittain collection could be forthcoming. And if you haven’t checked out the treasure trove of titles put out by Crippen and Landru, hurry over to their website as soon as you can. < Previous A.C.D.B. – An Announcement! I’ve read my share of EQMM, Brad, and AHMM. Those stories are memorable, aren’t they? And, when I was young, they were a great way to ‘meet’ all sorts of different authors, who wrote in all sorts of different styles. That was really helpful to me as I started to learn about the genre. I do need to read some Brittain, so thanks for sharing that. Thanks for this enthusiastic piece, Brad! I had great fun putting the book together, and your appreciation is a lovely bonus! Happy to do it, Josh! Since you had a hand in both this and The Misadventures of Ellery Queen, two of my favorite books of the year, it’s the least I could do! Are you KIDDING me?!? I’m gonna have to wait years for this, right? Nope, not years. We hope to have it out in 2019! Shoot, I already made out my Christmas wishlists… The “Man Who Read ___” stories have always sounded interesting. Nice to know I don’t have to hunt them down one by one. That choice of cover was a total coincidence, Jack! But if it helps call attention to Hoch as a mainstay of EQMM for all those years, then vive le coincidence! This is, at present, unavailable from any UK seller as far as I can see — and I’m in agony, because it’s a book I’ve been excited about since it was announced. I blame Brexit. It’ll cost more to have C&L ship it to the UK, JK, but if your agony is agonizing enough, perhaps it’d be worth the extra expense?…. Yeah, I know, Josh — I intend to buy it direct from you guys rather than wait for a second-hand seller as I want to support the excellent work you’re doing. My plan is to hold off until the Crofts collection you have coming out next ear and then buy both together in the hope that combined postage will pay off slightly better! But, man, what a wait…! That’s odd – the book is dedicated to Theresa May . . .
Well, the author IS called Britain, after all. Oh, he wrote THAT story! That is one of the true masterpieces.